Opening Weekend...with our whole team...nice. Unfortunately, we had to leave very early in the day, so several people missed classes on Friday, but overall this year our schedule is great, so at least it won't happen that often. We loaded up the bus, headed south to Rhode Island, and started our season on the road. 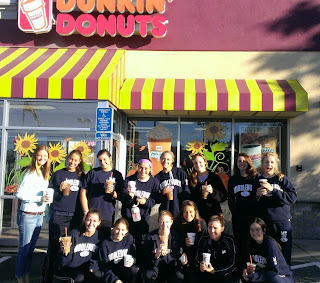 Despite having never been to Johnson and Wales, some things about our trip seemed very familiar, including a stop at Panera to pick up our lunch on Friday, and of course, a stop at Dunkin' Donuts on Saturday morning! 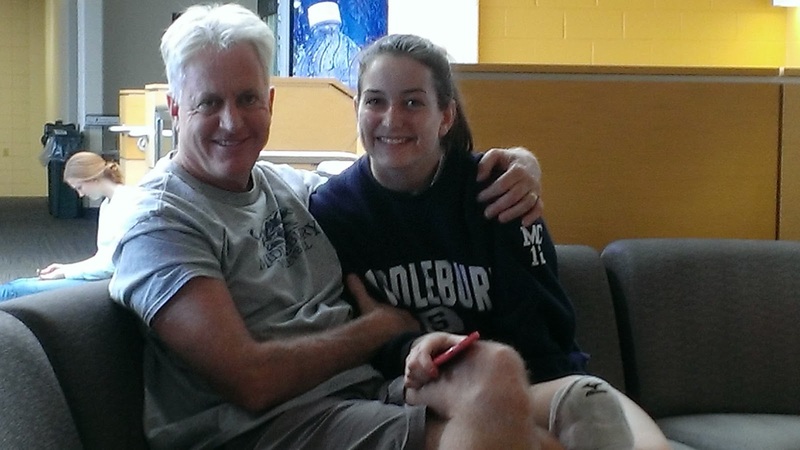 Meg served 18 points IN A ROW against Mt. Ida, sprinkling 5 aces in that streak. Playing 3 matches on Saturday was a bit tough, and we won't have that situation again all season, thank goodness. 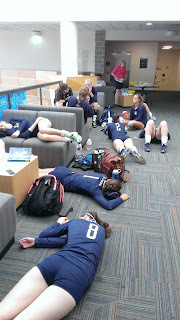 The team took advantage of our "match off" to eat and refuel, sleep, and study, as you can see below. 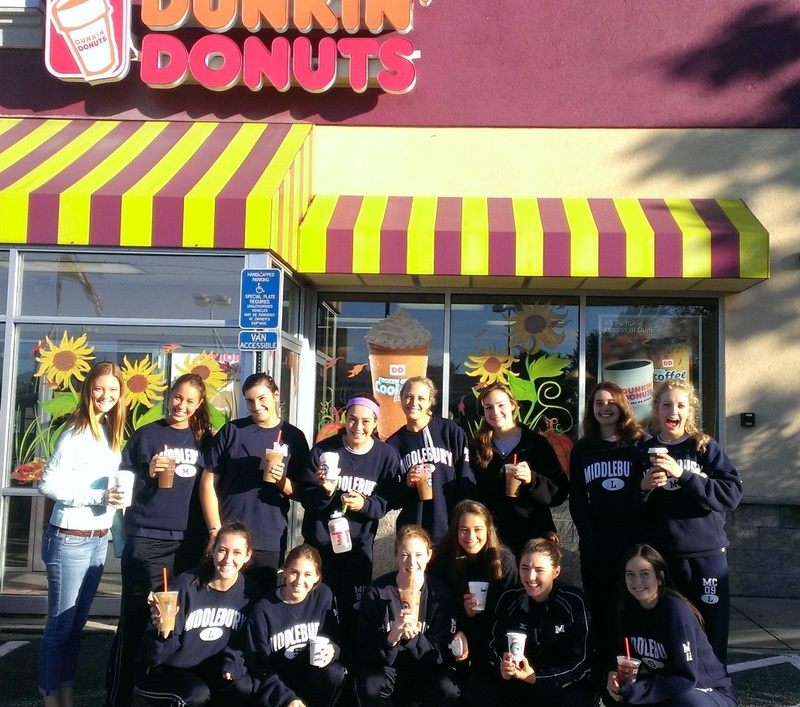 It was a great team weekend with everyone contributing significant minutes. After competing against each other in practice for almost two weeks, it was great to have other opponents that we didn't know anything about. We have never had such a long pre-season before, at least so it seemed. It's always nice to play different teams, and J&W couldn't have been nicer hosts for a great volleyball tournament experience. MJ was named to the All-Tournament team for her efforts, so congrats MJ! We had several parents on hand, which was also great! Lauren's dad made it out for Friday night and even came armed with a whole big box of delicious cupcakes for Lauren's birthday!! Katie's parents put out a huge lunch spread for us on Saturday, which was healthy and wonderful. Meg's parents, MJ's parents, Katie's parents and brother, and Lauren's dad were all on hand, and I think several others were tweeting (yes, we have a Twitter now @middvball) during the matches. Now, we have all week to recoup, and get back to work in practice on our skills before we face off with our first NESCAC opponent, Colby, on Saturday afternoon, Sept. 21 for our Home Opener!